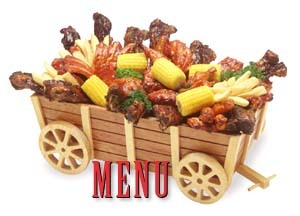 This is a traditional Love's BBQ menu for our restaurants. We don't have any open restaurants at this time, but you can buy our sauces and prepare delicious dishes in your own home. Luncheon menu not available after 4:00 pm or all day Sunday. Each of these comes with your choice of any two of the following: Love's Barbecued Beans; our Cole Slaw; Steak Fries or Buttered Corn Cobette. Each comes with one side dish. Each of these comes with soup, salad or cole slaw plus your choice of any three of the following: Love's Barbecued Beans; our Cole Slaw; Steak Fries, Mixed Sautéed Vegetables or Buttered Corn Cobette. Presented In our takeout version of Love's Exclusive "Family-Style Wagon!" Each wagon is packed for two or more hungry people. Piled high with all of the following: Texas Beef Ribs; Ultimate Baby Back Ribs; Flame-Broiled BBQ Chicken, and Buffalo Wings. Plus Corn Cobettes, Steak fries our Gold Medal-winning Barbecued Beans and Cole Slaw, juicy Pineapple, and Hot Bread. Enough portions of everything for each of you to share, family style! Everything you could ask for is built right in. For almost half a century, folks have agreed: "When you're in Love's, the whole world's delicious!" Now you can take us with you. Many items on Love's menu can be packaged to bring home, to the office, to a party, picnic or barbecue. Call ahead, and we'll make sure that it is ready when you arrive.